When you have a cast bringing together Bradley Cooper, Jennifer Lawrence, Robert De Niro, and Jacki Weaver, you can’t help but start out skeptical that they can reach the full potential of what all that enormous talent is capable of delivering. I am ecstatically happy to report (having just returned and still drying my eyes) that on this occasion, in the finely skilled hands of David O. Russell, the result is so good that I haven’t been as crazy about a film since Crazy Stupid Love. This is why I go to the movies (especially with my wife that I’m equally crazy about because she loves them just as much and cries right beside me). Movies may be just a spice in the drink of life, but the very best ones can make it taste so sweet that your thirst for everything is redoubled. Silver Linings Playbook is that kind of film. Grace your holiday with it. 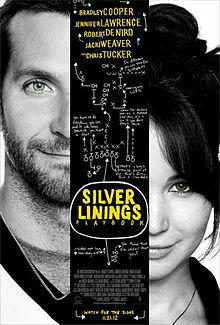 I loved Silver Linings Playbook, I think it is one of my favourites of 2012 along with Perks of being a Wallflower!